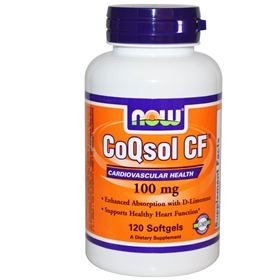 CoQsol-CF is a unique, patent-pending formula of CoQ10, food grade d-limonene (which serves to solubilize CoQ10), and tocopherol (vitamin E). This combination creates a liquid, crystal-free solution of CoQ10 that provides enhanced bioavailability. By improving dissolution, absorption is enhanced. Other Ingredients: Softgel Capsule (gelatin, glycerin, water, turmeric powder, zinc oxide, natural colors), D-Limonene Oil and Medium Chain Triglycerides. Contains soy derivatives. Contains no: sugar, salt, starch, yeast, wheat, gluten, corn, milk, egg, shellfish, preservatives or titanium dioxide.